Girls: Solid color leotard with pink tights and pink leather ballet slippers. Girls: Black leotard with pink tights and pink split-sole ballet slippers. Beginner-Int Levels No long pants are to be worn in tap or jazz classes. No exceptions! Girls: Solid color leotard and tights. Advanced class ONLY may forgo tights and wear a solid color biker short. All Females require tan pedini’s. Up to level II. Intermediate and advanced Jazz will require a tan half turner. Pre-school tap girls require light suntan Mary Jane style buckled tap shoes. Boys black oxford tap shoe. Beginner/Int require tan Mary Jane style buckled tap shoe. Int. II require a tan oxford tap shoes. Intermediate and advanced require a black oxford tap shoe. Hip hop dancers may wear hair in a neat ponytail. Girls: Solid color leotard and black tights or dance pants/biker shorts and bare feet. Advanced class ONLY may forgo tights and wear a solid color biker short. All female dancers will have their hair in a tight bun with a hairnet and bobby pins for all dance classes. Male Dancers: White t-shirt and black shorts or sweatpants/dance pants. Appropriate footwear for class.Boxer shorts, pajama pants, and baggy clothes are not allowed. Any dancer not properly dressed for class may be asked to observe for the day. No loose or dangling jewelry. The dress code is required for the discipline of dance as well as the safety of your dancers. All dancers level II and up are required to wear full stage make up. Costumes must be steamed and sewn to be stage ready. Hair and costume requirements per dance will be stated as performance and picture dates approach. No Jewelry, Nail/Toe Polish, Piercings, or Tattoos during these events. If a dancer has a visible tattoo or body piercing they will be asked to cover it up. NO EXCEPTIONS. Pageant Training, Specialty Choreography, Private Lessons, and Master Classes have separate price rates and are not included in regular pricing. Pre-requisite requirements for classes: Classes for the intermediate and advanced dancer require certain classes are taken in order to be eligible for other classes. Classes marked with a ** on fall schedule denotes that a minimum of two ballet classes are taken a week to be enrolled in that class. This includes Dance Progressions Dance Ensemble. Classes marked with a * on fall schedule denotes that one ballet class is required to be enrolled in that class. Senior Choreography: Senior students who are enrolled in a minimum of two technique classes per week will be offered the option of a solo, duet or trio to perform in the recital. 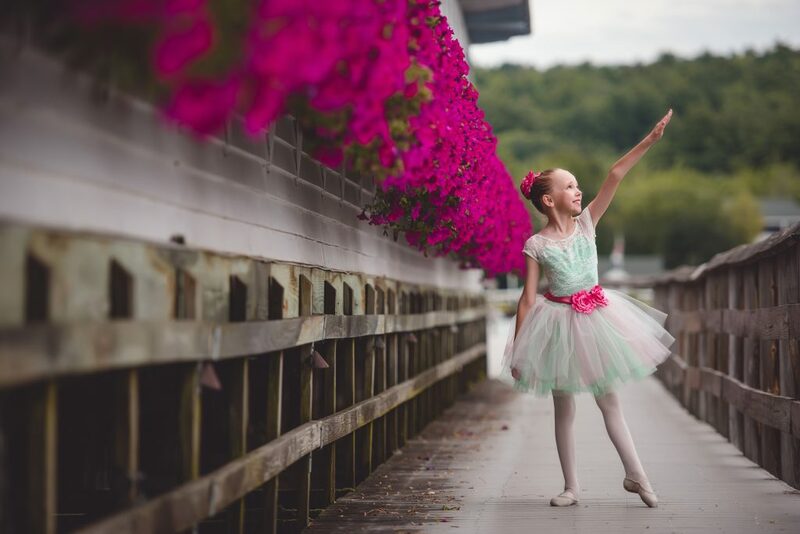 Technique classes include Ballet, Jazz, Tap, and Modern. Pricing will be evaluated upon request. A non-refundable costume deposit of $50.00 per costume per dancer is due by October 5, 2018. The balance of the costume is to be announced and will be due by December 31, 2018. Registration fee, First months payment and costume deposits are non-refundable. Year paid in full is non-refundable. Students will not be refunded for classes taken under any circumstances. A fee may be assessed for withdrawal after the month of December. If a snow day/absence occurs make up classes will be available by attending an equal leveled class. If your dancer must be absent please call the studio and leave a message. We do not follow the public school system when regarding cancelation for snow days. We will decide the status of class based on the road conditions. Please call the studio phone by 8:00 AM for status of morning classes. Please call the studio phone by 1:00 PM for status on afternoon and evening classes at 603-432-2129. Please show respect for your teachers and fellow dancers. No talking, touching, hanging on Ballet barres or gum chewing will be allowed in the classroom. Regular attendance and prompt arrival is appreciated. Attendance is imperative for a dancer to progress in class. Members of the Dance Progressions Ensemble are required to make up no less than 50% of their missed classes. Dancers must be on time for all classes and rehearsals. If the student is more than 10 minutes late it is up to the discretion of the instructor if the dancer is to participate and may be asked to observe the class. Please be a good role model and keep it positive! Negative or inappropriate language and/or behavior will not be tolerated and may result in dismissal of both parent and/or student from Dance Progressions. Please communicate concerns sooner rather than later by contacting the studio to make an appointment. Dance teachers are not to be interrupted before, during or in between classes. Every effort will be made to address your concerns in a timely manner. We follow the Public School District regarding vacation weeks and holidays. Dance Progressions will be closed the following dates. Please note that we do no observe most Monday holidays. Returned checks will be charged a $25.00 fee. Tuition is due ON OR BEFORE THE 1ST DAY OF THE MONTH REGARDLESS OF BANKING BUSINESS DAYS. Payments made beyond the 15th of the month will incur an additional $15.00 late fee per dancer. PREFERRED METHOD IS BY AUTO PAY THROUGH OUR ONLINE PAYMENT STSTEM.